The Essential Physics Modular Circuits Kit includes everything shown here. 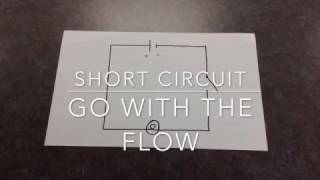 The simplest, cleanest and most visual way of learning the core principles of basic circuits. Our circuit modules eliminate the mess of wires and allow students to build circuits that end up looking like circuit diagrams, strengthening their conceptual understanding. This set was designed for use with the revolutionary Essential Physics textbook but may be used as a standalone set as well. Each module connects mechanically by sliding the tabs into one another and then a jumper clip is inserted which both emphasizes that an electrical connection has been made and allows for easy measurement anywhere in the circuit. They are completely self contained and can be built anywhere - no special surface required. Two different Modular Circuits Kits are available. The Basic Set is a lower cost, introductory set with fewer components and the Wireless Voltage Sensor and Wireless Current Module are not included. This Essential Physics Set includes more components, includes the Wireless Current and Voltage Sensors and allows for a wider range of activities. The large size of the modules (8 cm x 8 cm) enables all the students around the table to see and understand the completed circuit. The components (resistors, switches, batteries and more) are also physically visible on the tops of the module alongside their electronic symbols, reinforcing concepts. Instructors can see at a glance whether the circuits have been built correctly rather than having to check each connection. They can be used as a standalone with basic lab meters or in conjunction PASCO's wireless current and voltage sensors (sold separately) and data collection and analysis software for a complete learning solution. Each kit comes in a Gratnells™ case with trays that organize the modules. The Wireless Current Sensor Module can replace any straight wire module to measure current at that point. Since the Current Sensor Module is in the same form factor as the other modules, it naturally fits in series with the components. And being wireless it aids the pedagogy - there is only one way in and one way out of the Current Sensor with no extra wires to confuse students. Likewise, the Wireless Voltage Sensor is connected across any module in parallel with the circuit, helping students understand how measurements are made. Fun to use but designed from the ground up as learning tools, not toys. Bridges the gap between circuit diagrams and actual circuit construction. The following experiments are available for download and use with this Modular Circuits set. These activities are designed to be used with the included Wireless Voltage Sensor and Wireless Current Sensor Module and PASCO data collection and analysis software. 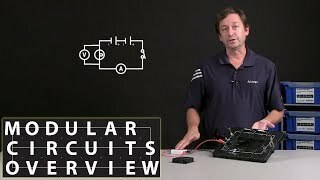 From our "PASCO Shorts" series, here is a very brief introduction to our new Modular Circuits sets as well as an extended overview of the system. This expansion pack supplies extra modules found in both the Basic and Essential Physics Modular Circuits Kits.